The cannula market is estimated to grow at a CAGR of 5.6% from 2015 to 2020 to reach $135.5 million by 2020.The report segments the global cannula market by product, by material, by application, by end-users and region. On the basis of material, the market is divided into plastic, metal and silicone. The silicone material is estimated to be the fastest growing segment during the forecast period. On the basis of end users, the cannula market is divided into hospitals, ambulatory surgical centers, and others (blood banks and home healthcare facilities). Hospitals segment accounted the largest share of the cannula market as compared to ambulatory surgical centers, and others. This can be attributed to the growing number of patients and increasing healthcare awareness. In application segment, the cannula market is segregated into cardiovascular surgery, oxygen therapy, general surgery, cosmetic/plastic surgery, orthopedic surgery, and others (diabetes treatment, ophthalmic surgery, gynecology and neurology). The cosmetic/plastic surgery segment is expected to be the fastest-growing segment owing to increasing health consciousness and growing number of obesity cases, leading to increasing number of cosmetic surgeries. Based on type of product, the global cannula market is segmented into cardiac, vascular, nasal, arthroscopy cannula, dermatology cannulas and others (floating spinal cannulas, vitreoretinal cannulas, and hysterosalpingography cannulas). The dermatology cannula segment is expected to be the fastest-growing market by 2020. The major driving factors of this market are increasing number of surgeries, advancement in the healthcare facilities, increased investment in R&D, large pool of patients, and rising government funding. Increasing minimally invasive surgery (MIS) procedures is also one of the key drivers of this market. However, uncertain regulatory framework in medical devices industry is limiting the growth of this market. The key players in cannula market include Medtronic plc (U.S.), Edward Lifesciences Corp. (U.S.), Terumo Corporation (Japan), Sorin Group (Italy), and Maquet Holding B.V. & Co. KG (Germany). This research report categorizes the cannula market on the basis of products, application, material, end users and regions. The global cannula market is expected to grow at a CAGR of 5.6% from 2015 to 2020 to reach $135.5 million by 2020 from $97.6 million in 2014.The market is expected to grow in the forecast period owing to increased investment in R&D, growing demand of minimally invasive surgery (MIS) procedures, large pool of patients, and increasing number of surgeries. However uncertain regulatory framework is hindering the growth of cannula market. On the basis of products, the market is divided into the global cannula market is segmented into cardiac, vascular, nasal, arthroscopy, dermatology cannula and others (floating spinal cannulas, vitreoretinal cannulas, hysterosalpingography cannulas). On the basis of end users, the market is divided into hospitals, ambulatory surgical centers, and others (blood banks and home healthcare facilities). Hospitals segment accounted the largest share of the cannula market as compared to ambulatory surgical centers, and others. On the basis of material, the market is divided into plastic, silicone, and metal. Silicone is expected to be the fastest-growing segment, owing to the increasing usage of silicone-based cannula in oxygen therapies to provide continuous oxygen supply to the elderly population and patients suffering from respiratory disorders. 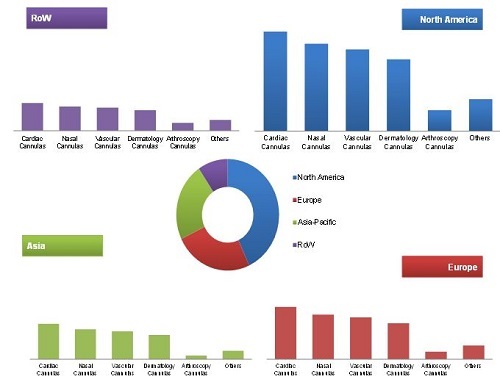 Geographically, the cannula market is dominated by North America, followed by Europe. However, the Asia-Pacific region is expected to be the fastest growing region in cannula market during the forecast period. Increasing awareness about MIS techniques in countries such as China, India, and Japan, increasing purchasing power of the middle class population are augmenting the growth of this market in Asia-Pacific region. 13.6 Smith & Nephew PLC. 13.10 Maquet Holding B.V. & Co. KG.